Both Korea and Japan are countries that were heavily influenced by the civilization of China. Many countries of the Far East, such as Thailand, Burma, and Tibet have writing systems which are derived from the same source as the scripts of India, such as the Devanagari script, but writing in both Japan and Korea stems from the Chinese characters. In Japan, the use of the Chinese characters themselves, called kanji, is still the basis of the normal writing system in everyday use. Because the Japanese language is very different from the Chinese language, and includes word suffixes, a syllabary, hiragana, is used for writing these suffixes. As well, the syllabary can be written in another style, katakana, used for various special purposes. A kanji character normally represents both the native Japanese word with a given meaning, and the compound form with the same meaning borrowed from Chinese. The former use is called kun-yomi, and the latter on-yomi. In Korea, for many years, Chinese characters were used to write the Korean language. Like Japanese, Korean is different from Chinese, and at first word suffixes were represented through the use of Chinese characters. 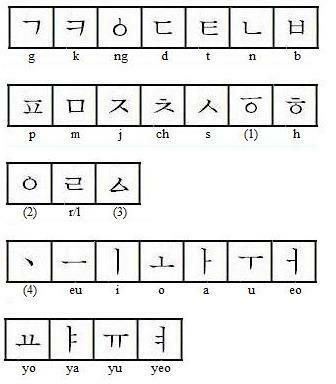 The main writing system used for this was Idu; a variant of Idu, Hyangchal, was used for writing Korean-language poetry. Another Korean phonetic writing system, Gugyeol, was used to annotate Chinese-language texts. In 1443, King Sejong of Korea finished years of work in devising the Hangul alphabet for the Korean language, and then proclaimed it three years later in 1446. Although it consisted of individual symbols that represented either vowels or consonants, the letters (or jamo) that formed a syllable are composed into a square unit, thus retaining a link to the Chinese writing system. Some notes apply to the pronounciation of a few characters. (1) This letter denoted a sound similar to that of the Hebrew letter Ayin, an aspiration. (2) This symbol took the spot for an initial consonant in a written representation of a syllable that did not have an initial consonant. Originally, it was distinct from the symbol for the final consonant "ng"; today, the same symbol is used for both. (3) This letter denoted a sound similar to that of the Hebrew letter Tzaddi, a weak "z" sound. (4) This letter, known as arae a, is still used in some Korean dialects. 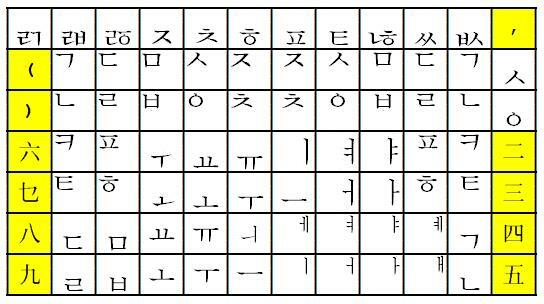 The order of the letters was changed in 1527 by Choe Sejin, and the current Korean alphabetic orders (North and South Korea have different ones) derive from that changed order, but with new letters formed from pairs of pre-existing letters added. This system was not immediately adopted, and, in fact, was largely disused for centuries due to opposition from the established literate class. But it was not lost, and eventually became Korea's main system of writing. Chinese characters, called hanja, can still be included in texts written with Hangul; this was done to resolve ambiguities due to homophones, and also due to traditionalism, as well as the feeling that a knowledge of Chinese characters is the most important part of erudition. The Hangul system of writing meant that it was possible to devise typewriters for the Korean language which were only slightly more complicated than typewriters for simple alphabetic scripts - not just the Latin script as used for English, French, German, Polish, Hungarian, Estonian, and many other languages, but also the Hebrew script, or the Armenian script, and so on and so forth. This contrasts with typewriters for Chinese and Japanese, which used a tray with many characters, slid into position so that the desired character type slug could be borrowed and struck against the paper. Japanese managed fairly well with a tray of about 2,000 characters; Chinese typewriters either needed a larger tray, or a second tray with less common characters, as for that language, about 4,000 characters was barely adequate. One of the letters in the Korean alphabet stands for the sound "ng", which, in Korean, as in English, occurs only at the end of a syllable. When a syllable begins with a vowel, this symbol is used as the initial consonant for that syllable instead of simply not writing an initial consonant. 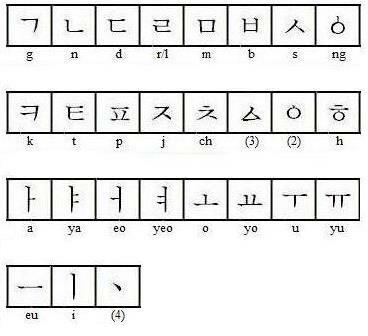 Thus, when a syllable is written - or typed - in Hangul, an initial consonant and a vowel will always be present. The final consonant, though, is optional, and may be omitted. Therefore, many Korean-language typewriters (not any that wrote the Hangul script in the traditional Chinese order of top to bottom, then right to left, of course, and not all of them that wrote it in the Western left to right order either) advanced the carriage when an initial consonant was typed, advanced it again when the vowel was typed, but treated the final consonant keys as "dead keys", just like the keys used for typing accent marks on Western typewriters. On a Western typewriter with accents, using dead keys, it was necessary to type the accent first and then the letter, so that both would be typed on the same space. This was somewhat unnatural, because when writing, one writes the letter first, and then the accent so that the accent can be properly centered. One could do the same thing with a Korean typewriter, and expect the typist to type syllables in the order initial consonant, final consonant (if any), vowel. But, in general, Korean typewriters do not do this, and instead make a provision for displacing final consonants to the left so that the order in which Hangul letters are typed is normal. The first two known attempts to make a typewriter for the Korean language involved printing Korean in the traditional Chinese orientation. The first of these attempts took place in Hawaii around 1914, by Lee Won-Ik. According to one web page, one of his typewriters now resides in a Korean museum. It had seven rows of twelve keys, and no shift, as it was based on the existing Smith Premier 10 typewriter. In this image, conventional characters such as punctuation marks are shown with a yellow background. This prevents confusion, as this typewriter used Chinese numerals rather than conventional Western Arabic numerals. The position of the jamo in the squares representing the keys indicates the position in the printed syllable in which it will be placed. These positions differ somewhat from those in the diagram in my source, as I checked them against an illustration of a sample of printing from that typewriter; thus, consonants shown as being centered vertically on the left side of a syllable are instead shown as being in the upper left corner, for example. The second, dating around 1934, was by Song Ki-Ju, also a Korean-American, who was known as Keith C. Song as well, to spare Americans trouble in pronouncing a Korean name. His own company sold typewriters of his design, but they were manufactured for him by Underwood. The Underwood typewriter company had a connection to Korea; Horace Underwood, a missionary in Korea, was the brother of John Underwood, the founder of that company, and, thus, John Underwood supported his brother's endeavors in Korea. This included manufacturing this first Korean typewriter, and it included the establishment, in 1885, of Yonsei University in Korea. A specimen of Song Ki-Ju's typewriter is held in the Hangul Museum in Korea, and was recently featured in news stories, most of which referred to it as the first Korean typewriter. Tragically, Song Ki-Ju was among the many people from South Korea abducted by the North during the Korean War. If, as is the convention with Western typewriters, on those keys where one symbol is above the other, the shifted symbol is the one on the top, then it appears, given the layout of jamo on the keys of the first column of the bottom three rows, that the shifted symbol is the one on the right when two symbols are side by side on a key. On the other hand, comparing later keys in the bottom two rows, on the bottom row, the vowels are unshifted, and, since vowels are more common, and so on the second row from the bottom, if that pattern were continued, the shifted symbol would be the one on the left, and so I can't be confident of which convention was used. Apparently, the position of characters on the keys is intended to serve not only as an indication of which one is shifted, but also of the position of the characters within the syllable block when typed. I have seen Song Ki-Ju's typewriter referred to as a "4-set" typewriter, but because it typed vertically, its design would be significantly different from later typewriters of that class. The design of typewriter that I described above, with the characters written from left to right, and where the final consonants are displaced to the left, and do not advance the carriage, was introduced by Byung Woo-Gong, also famous as Korea's first opthamologist, and is described in U. S. Patent 2,625,251, issued in 1953, and applied for in 1949. His typewriter is what is known as a "3-set" typewriter. This means that it provides for typing the consonants in one initial form and one final form, the third set of jamo being the vowels. This makes for relatively fast and efficient typing, but it involves compromises in the appearance of the Korean syllables on the printed page. In the early typewriters of this kind, those characters which were displaced to the left were grouped together, so that for any key on the typewriter, both the shifted character and the unshifted character either were displaced to the left, or were not displaced to the left. This meant that the consonants appeared twice on the keyboard, once in initial form, and once in final form. The other major variant of the Korean typewriter is the "5-set" typewriter. This style of typewriter was invented by Kim Dong-Hoon, and while typing on it was slower and more difficult, it produced more attractive typescript. I was able to find pictures of the keyboard of one 5-set typewriter, dating from 1958, on the Internet after a considerable search. And it is a 5-set keyboard because most consonants appear three times, and most vowels appear twice. This is clearly a 4-set keyboard, since the vowels also have keys of their own, so they come in both a shifted and an unshifted form. Incidentally, it is possible for an interchangeable element typewriter to type in Korean, although normally either a large number of dead keys would need to be present, or frequent backspacing would be required. The instruction manual for a later version of the VariTyper includes an illustration of a Korean element for the device. Also, the section on Hangul in the King Sejong museum in Korea has a Selectric element for Korean on display, as I learned from a web site about one individual's visit to that museum. One other search result I had suggests that the arrangement of Korean jamo on Selectric elements for the Korean script follows that of Remington typewriters for the Korean language. The VariTyper element only contains the Korean script, and it contains multiple copies of the same jamo in different positions, so it is indeed intended to build up Korean syllables as they are normally written in Hangul. One typewriter for the Korean language by Remington that I have seen pictured on the Web is of a different kind from those discussed here: it is merely a conventional typewriter, with both Latin capital letters, and jamo occupying the full character cell. With this typewriter, jamo are just used as if they were the letters in an ordinary alphabet, typed horizontally in sequence, with the intent that this would be at least readable to a Korean, if unattractive and inauthentic. The photo including a pair of Selectric elements for Korean in a display case at the King Sejong museum, where they sit upon a placard with a keyboard layout diagram, that I have encountered is of limited resolution. I had considered the possibility that they were of the type noted above, since some of the keys looked like they might have had letters of the Latin alphabet on them, but looking again it seems like this is not the case, and they instead embodied a 4-set arrangement, as a label below the placard seems to state.